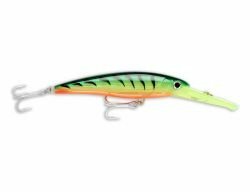 Rapala X-Rap Magnum Lure. The precision diving-lip takes the X-Rap Magnums deep… unassisted. Nothing to hinder the action. Each dives to its preset depth…the XRMag30 to 30 feet. Run up to 13 knots for big game fish worldwide. How to fishBuilt for trolling and casting; the X-Rap Magnum is designed to reach the predetermined running depth with 30 meters of line out; XRMAG30 stands for 30ft. If you want to use a larger lure in shallow water, let the lure run with less line to adjust the running depth. Using thicker line that has more resistance in the water also reduces the running depth.